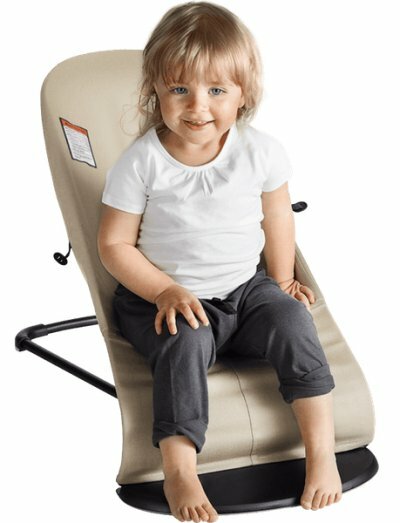 How To Find Best Baby Swing Of 2019? You don’t have time to do the housework? Or maybe you miss having ME TIME? I get it! I’m a parent too. That’s why I created for you this list of best baby swings and bouncers in 2019. Whichever you’ll choose, one thing is for sure: it will give you free hands to do some household tasks or a moment just for you. I’m sure that as a parent you want the best for your baby and you want to use products that are safe for them. You don’t want your baby to fall out of the baby swing. You don’t want your baby to be disturbed by unwanted loud noises when the swing is moving. You don’t want your baby to lie in uncomfortable and unsafe position which could have a negative impact on their health and cause some spine curvature disorders. Am I right? If you’re here, you’re probably wondering how to choose a safe swing and what is the best baby swing for 2019! There are many different models on the market, some of them have toys attached to it, vibrate or play songs. Others are pretty simple and just rock the baby smoothly. It depends on your needs which baby swing will be the best for you. Suitable from birth up to 130 lbs! As a mother I always carefully choose products for my babies. I want to them from spine disorders or getting hurt in any other way and I am sure you feel the same way. That’s why I created this ranking FOR YOU. My list of the best baby swings will help you to avoid such things and provide your baby with the best products – because your baby deserves that! What features should baby swing have? This ranking is made for you – so you could pick the best baby swing, which will provide safe and comfortable space for your little bundle of joy and will give you some free time, without worrying whether your baby won’t get hurt. Let’s start with baby swings that parents can use during the first months, when the baby is not able to sit upright and walk. This is a great classic baby swing with multiple functions. If you want something more versatile, this baby swing is a good solution for you. 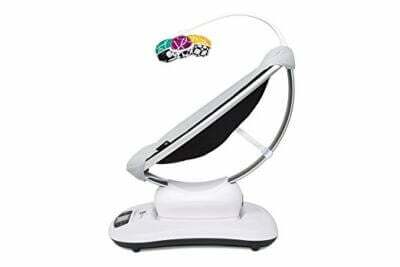 First of all, it rotates 180 degrees and moves in three directions so you could always keep an eye on your little one. There are two different movements. Some babies prefer side-to-side swaying, while others like back-and-forth rocking. With Ingenuity SimpleComfort Cradling Swing you are able to switch between these two moves, depending on your baby’s preferences and mood. There are 6 speeds that remain consistent even as the baby grows. There is a swing timer with auto-shut off so you can control how long baby swings. What I really like about this baby swing is how quietly it moves! Baby can lie back and relax undisturbed. It’s really important because when baby is fussy, colicky or teething swinging noise might be annoying and disturbing for him. Therefore this silent baby swing is perfect for calming and putting baby to sleep. The seat has two-position recline and it is nicely padded with soft, plush fabrics that cradles the baby. Reclined position is perfect for younger babies, while the sitting up position is more suitable for older infants. You can adjust it not only for baby’s comfort, but also change it as the baby gets older. The seat is equipped with 5-point harness. There is also a head support for newborns, that can be removed as the baby get older. The seat pad is removable and machine-washable. The frame and toy bar can be clean with wipes and wet cloth. There is also a mobile with two plush toys pivoting over baby’s head. They encourage baby to practice motor skills by reaching and grasping and stimulate baby’s vision. Parent have a choice of 8 melodies, 3 nature sounds and white noise that can comfort or entertain their baby. There is also a volume control which is very handy. This baby swing combines two important features: versatile seat that moves in a few different ways and a lightweight and portable construction. You don’t have to compromise between baby’s comfort and your own convenience. 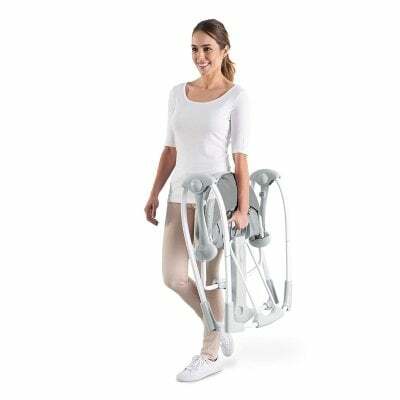 Thanks to multiple functions Ingenuity SimpleComfort Cradling Swing will occupy your baby for longer period (good choice if your baby gets bored quickly) and you will be able to easily move it around the house – thanks to lightweight frame with wheels and pull handle! Moreover, it’s noiseless, so you can be sure your baby won’t be disturbed by any unwanted noises. This baby swing is perfect for comforting fussy baby, as well as for the playtime. As always I checked online customer reviews to find out what others think about this baby swing. What advantages and disadvantages it has according to other parents? 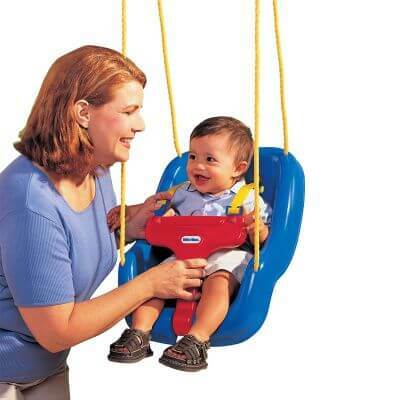 This baby swing is pretty cheap but keep in mind the price may vary for different colors. Click here to check prices of different colors. 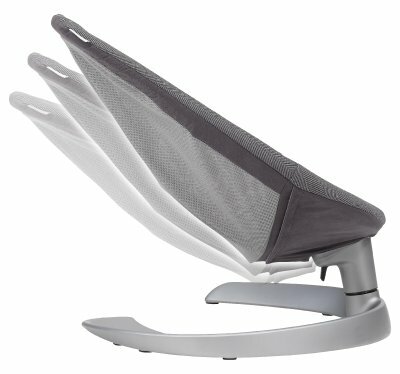 Ingenuity SimpleComfort Cradling Swing is suitable for babies from birth up to 20 lbs. Remember to use it only for child who can’t climb out of it. 4moms designs very modern and innovative products but mamaRoo4 is even more than that. This is a unique baby swing – one of its kind! It has features that any other baby swing doesn’t have. Here’s a sneak peek. mamaRoo4 imitates movements that parents do when they are comforting and soothing their baby. It sways from side to side and bounces up and down. There are 5 motions: car ride, tree swing, kangaroo, wave and rock a bye. You can also choose one of 5 speeds to adjust it to baby’s mood. The seat has multi-position recline to provide maximum comfort for your little one. You can adjust the seat from full recline to upright position. So you can not only adjust it to baby’s mood and preferences, but also his age. This baby swing plays 4 soothing sounds, for more you can plug-in your MP3. It allows the baby to play or rest to his favorite music. mamaRoo4 has also built-in Bluetooth! Thanks to that you can control music and motion from your phone or other smart device that is compatible with it. This is truly innovative baby swing! Some parents may say this baby swing is too much, too fancy, but I’m sold! It moves exactly like I do when I’m cradling my baby. How great is that?! There is also a bar with reversible toy balls hanging over baby’s head. One ball rattles, the second one has crinkles, and the last one has a mirror. Their colorful fabric attracts baby’s attention. These balls stimulate child’s senses (vision and hearing) and motor development (encourage to reach and grasp) and keep him entertained. Manufacturers didn’t forget about other useful features like removable seat pad that is machine-washable. You can also choose the color version that will suit your style. Keep in mind the price may vary so better check it before you buy it. Here you can compare the prices. If your baby is colicky or teething and calms only when you cradle and rock him in your arm, mamaRoo4 will be your lifesaver! However, carrying baby in arms may be tiring after a while and here comes this perfect infant swing. This is the only baby swing that replicates natural movements of parents! There is no baby swing that would better sooth and entertain your baby. Once you use it, you will be totally amazed. It also has other innovative features, typical for this brand: built-in Bluetooth and MP3 plug-in. This is one of the most pricey baby swings, nevertheless it has over 200 reviews on Amazon so it’s pretty popular. What parents think about it? Here are the features that they praise and complain about. This is probably the most expensive baby swing and it differs from traditional models. Before you purchase it be sure to read more reviews written by customers on Amazon. 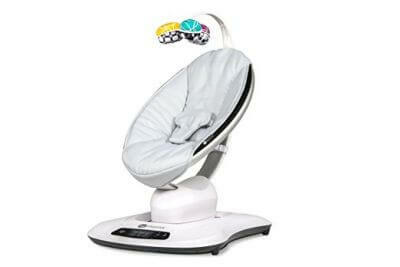 4moms mamaRoo4 is suitable from birth up to 25 lbs or when the child can sit up unassisted (whatever comes first). 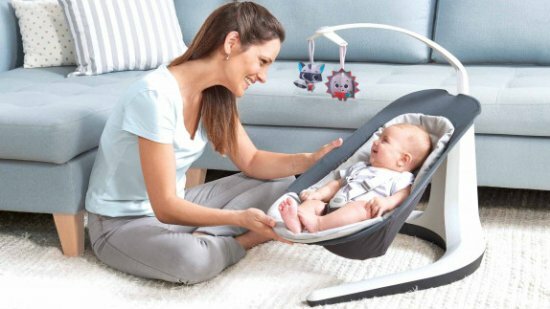 This baby product differs from others in this ranking – it’s actually more like a rocker than baby swing. I decided to included it in this list anyway, as it offers a bit different features which may be quite useful for some parents. Tiny Love Luxe 3-in-1 Rocker & Napper offers 3 reclining positions so you can quickly convert it from a seat to a napper. You can use the sitting position for play time or feeding. On the other hand, fully flat position is great for nap time. This may be your compact and portable bassinet. Thanks to easy, one-hand reclining mechanism you can quickly switch between different positions without disturbing your baby! So when your baby gets sleepy after playing or eating, you’ll be able to recline the seat without waking your little one up. The side walls can be raised to provide sheltered and safe environment for a nap time. Moreover, there is rocking movement that helps to sooth fussy infant. It’s also useful for putting baby to sleep. 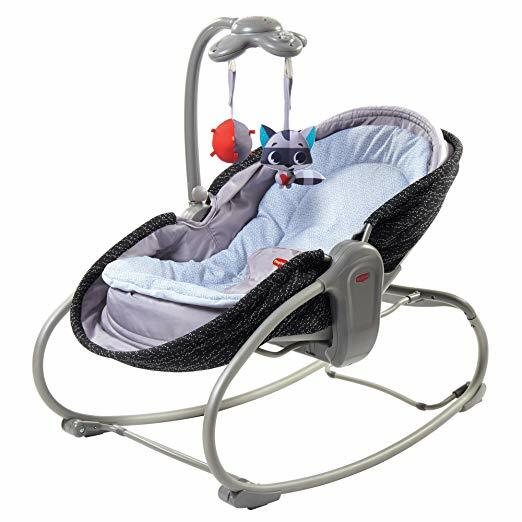 What is really great about Tiny Love Luxe 3-in-1 Rocker Napper is that it doesn’t take up a lot of space and it’s quite lightweight. Thanks to portability you can use it around the house – wherever you need it. The toy arm is adjustable – you can move it closer or further from baby’s palms. It encourages baby to reach for and grasp the colorful toys. This in turn, has beneficial influence on infant’s motor skills development. You can remove the toy arm for example when you want to put the baby to sleep. There are also 9 tunes that are attractive and entertaining for the baby. 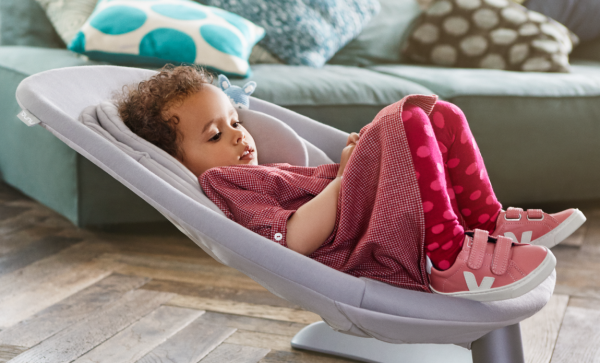 With Tiny Love Luxe 3-in-1 Rocker Napper you don’t have to worry about cleaning. The padded mat is removable and machine washable. This versatile rocker from Tiny Love is very popular and lots of parents praise its features. But it’s not ideal and you can find some drawbacks. Below you can see the main advantages & disadvantages that users have found. This rocker meets your needs, but you don’t know whether it suits your budget? Click here to check the latest price on PishPosh Baby. Tiny Love Luxe 3-in-1 Rocker Napper can be used from birth. It has weight limit of 40 lbs, although babies outgrow it quicker, before they reach 40 lbs. 4moms is well-known for its modern and innovative baby products. And the rockaRoo baby swing is one example of it! It is one of the top baby swings for 2019! Thanks to stylish and modern design it takes much less space than traditional swings while still offering useful and versatile features. And it’s one of the lightest baby swings on the market – it weighs only 11.5 lbs so you can easily lift it to move from one room to another! 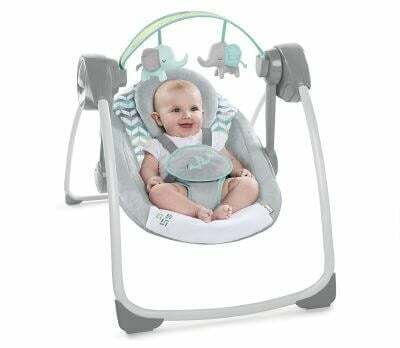 4moms rockaRoo baby swing features front to back gliding motion which is perfect for soothing colicky baby or putting teething infant to sleep. There are 5 speeds so you can choose the right one for your baby’s mood and preferences. This baby swing doesn’t make any sounds and doesn’t play songs, but… you can plug-in your MP3! So your little one can rock to his and your favorite music! There is an overhead bar with three colorful balls that stimulate baby’s senses, encourage baby to reach and grasp which is a great practice for motor skills and promotes eye-tracking. These toys are removable, so when you want to put your baby to sleep you can take off the balls so they don’t distract the baby. rockaRoo is easy to clean thanks to removable and machine-washable seat pad. The seat is also equipped with 3-point harness. 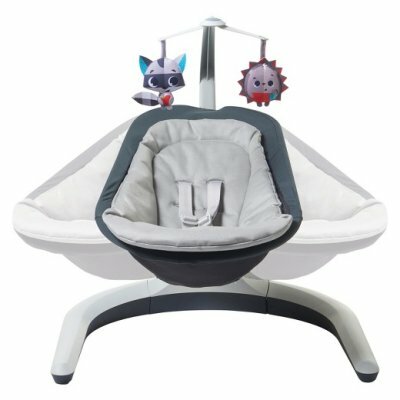 This modern baby swing is perfect for parents who sometimes need a break or help for their colicky baby. It takes less space than many other baby swings so it’s a great solution for small spaces. You can be sure this piece of baby gear won’t clutter your apartment! 4moms rockaRoo was design for modern parents who like products that follow the technological development. Moreover, this baby swing looks really awesome! You can choose different color designs for the seat pad, for example neutral grey or white with colorful dots. 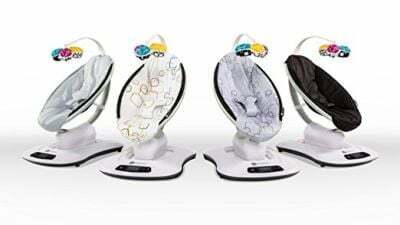 Just like 4moms Moxi is one of the most innovative and best strollers, this 4moms rockaRoo is one of the best baby swings 2019. This is one of the more expensive baby swings, however it is very popular! It has over 200 reviews on Amazon at the time of writing this (you can check the reviews on your own HERE). Here are the main assets and pitfalls, according to other parents. 4moms rockaRoo is suitable from birth up to 25 lbs or when the child sits up unassisted. 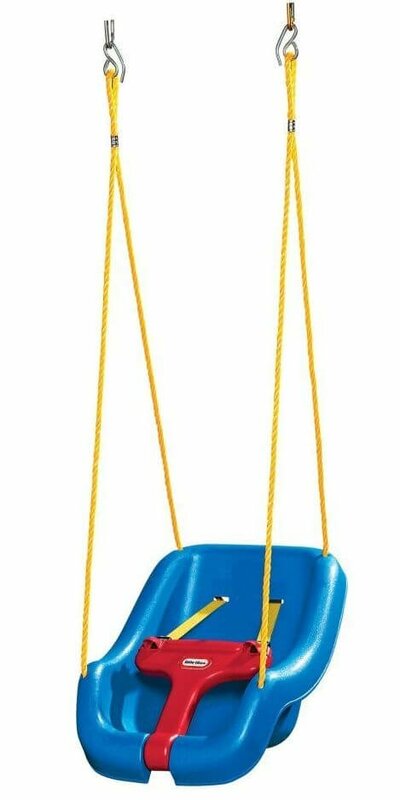 Keep in mind that this baby swing is more expensive one and the price may vary for these two color versions (picture above). Before you decide to buy it compare the prices and available discounts for each color. Click here to see the latest price on Amazon. This is another one of the best portable baby swings. It can be folded flat which simplifies storage and transportation. It is a great space-saver for those who have small apartments or need a portable baby swing for travel. It has a pretty small footprint so it doesn’t take up much space when it’s in use. And when your baby is not using it, you can fold it in few second. This baby swing is very compact when folded so you will easily find a place in your home to store it. 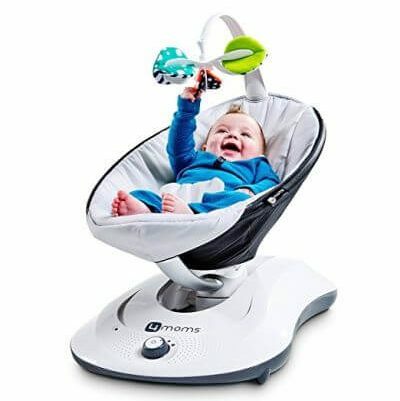 Moreover it is one of the lightest baby swings for 2019 so you could move it from one room to another without any problems. You will be able to use this small, lightweight and compact baby swing wherever you need to! Thanks to Ingenuity portable swing your baby will be always close to you, even when you need to do housework. Now let’s talk about other great features: comfort and safety. The seat has 2 reclining positions to adjust to baby’s mood and size. There are 6 speeds that remain consistent as the baby grows and gets heavier. All thanks to weight-adapting technology. 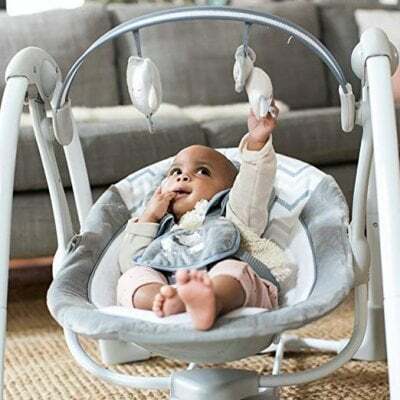 This swing moves back and forth and it’s pretty quiet so you can be sure your baby will rest and play without any distractions and unwanted noises. The seat is equipped with 5-point harness and removable pillow that supports smaller baby’s head. There is one more safety features which I really like: non-slip feet on the frame. The seat has a soft bottom, hammock-like, for better baby’s comfort. You can also toss the seat padding in the washing machine. 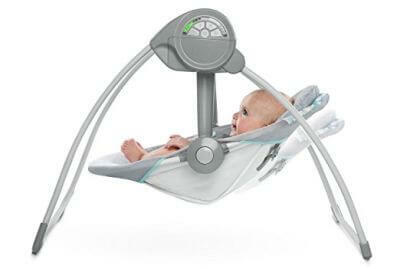 Comfort 2 Go Portable Swing from Ingenuity plays a few melodies to keep baby entertained and calm. Another advantage is the volume control. Over child’s head there is a removable bar with two plush toys for child’s amusement and visual and motor development. There is also a timer with three settings – it can shut off after 30, 45 or 60 minutes of swinging. It’s a very convenient and useful feature for parents. 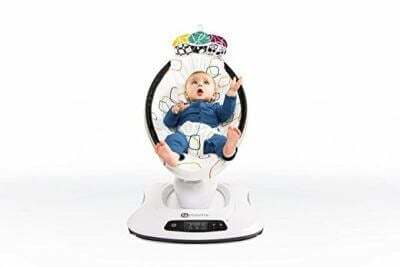 Thanks to this baby swing you will get few hands-free moments. It provides safe and comfy place for the baby to rest or play. And you can use it wherever and whenever you want – thanks to easy folding mechanism and lightweight and compact design. This is one of the best baby swings for small spaces. When it’s not in use you can store it folded in a closet. It doesn’t take up much space when open and you can move it around the house effortlessly – to keep your baby always close-by. It’s also useful for those who often visit grandparents or travel with their kids and want to have the soothing helper at hand. This baby swing has many positive reviews on Amazon, but also quite a few critical opinions. Nevertheless, I decided to include it in my ranking of the best baby swings for 2019, because it’s cheap and has few feature that may be useful for parents. Here are the main advantages and disadvantages that parents mention. Ingenuity Comfort 2 Go Portable Swing can be used for newborns up to 9 months or when the baby is able to crawl out of it (whatever comes first). The capacity ranges from 6 to 20 lbs. 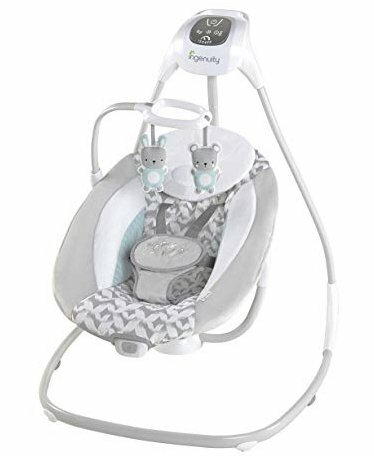 I’ve chosen this product for my ranking of the best baby swings 2019, because it has plenty useful features that keep baby comfy and safe and in addition it has compact and portable fold and option of plug-in. And all of that for a pocket-friendly price. Here’s a closer look. 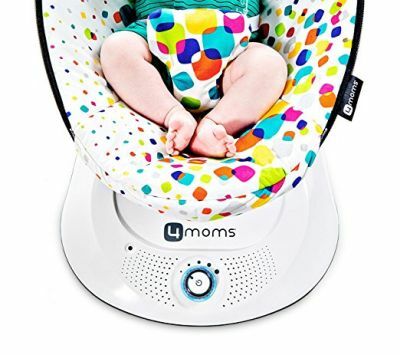 It features 1 motion – back and forth and 5 different speeds so you could adjust it to baby’s mood. The seat is nicely padded and has removable head support for the littlest babies. There is a 5-point harness to provide not only comfortable, but also secure place for your little one. The seat is easy to clean thanks to removable padding. Above baby’s head there is a bar with two plush animal toys that stimulate baby’s vision and encourage him to reach and keep him entertained. You can also play 8 melodies and 3 nature sounds that will help you to sooth or amuse your baby. There’s also volume control so you can choose perfect audibility for your little one. What I like about this baby swing is its quiet operation. Thanks to it your child could relax or take a nap without any distractions and annoying noises. There is a timer with shut-off function, so you can set the baby swing to automatically turn off after 30, 45 or 60 minutes. And here are another great things: there is a Hyberdrive Technology that allows to save the battery life even 3 times and you can switch to AC adapter whenever you want. And the best part is that this baby swing folds up very easily and can be carried with one hand! Thanks to such a compact fold you will store it conveniently, even if you have a small apartment. It’s also very portable – perfect for taking on a trip or visiting grandparents. This is an example of best swing for small spaces. This baby swing from Ingenuity is awesome choice for parents who want a baby swing that won’t ruin their family budget and doesn’t take up much space. This one is designed to fold up pretty small for convenient storage. It’s quite light which makes it even more portable. You can carry it around the house to keep your baby always close-by almost effortlessly. 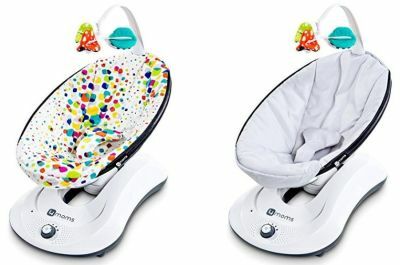 The seat is very comfy and safe for the infants and with the vast choice of melodies and sounds you will quickly comfort your crying baby or put him to sleep and finally have some time for yourself! Ability to switch between batteries and plug-in is also very convenient. This is also a cheap baby swing from Ingenuity. It is a travel, portable baby swing, so it doesn’t come with many versatile features. However it is high-quality and really beloved by many parents. It’s really hard to find another good-quality baby swing with AC adapter at this price point! In the table below you can see what features customers mention as assets and drawbacks. If you want to check the current price and available colors, just click here. Ingenuity Power Adapt Portable Swing is suitable from birth up to around 9 months (when the child can crawl out of it). It has capacity from 5 to 20 lbs. Baby swings are not only for soothing infants! There are also swings that are design for older babies to provide them with excellent playtime. 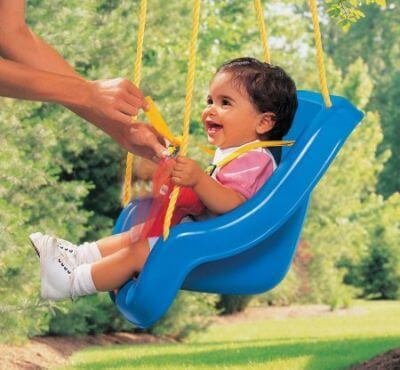 Here are the best indoor and outdoor baby swings suitable for toddlers and older children. If your child loves to swing, he will definitely love this indoor swing seat that looks like a small airplane! 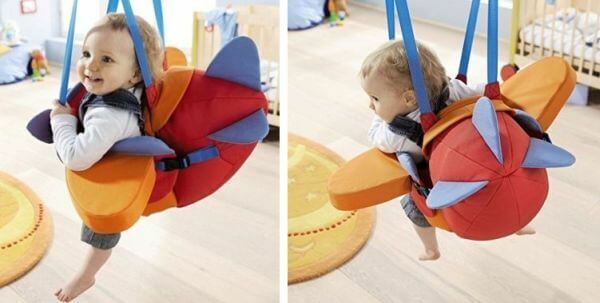 You baby will feel like a pilot while swinging in this adorable, colorful airplane. The blue propeller really spins and if parents make some rattling sounds to accompany it, the child will have awesome and unforgettable fun for sure! The whole swing is made of soft, plush fabric which gives baby maximum comfort during playtime. It is machine-washable, so it’s easy to keep it clean. The seat is suitable from 10 months and can accommodate a child up to 66 lbs! The Aircraft Baby Swing really grows with the child thanks to straps that can be adjusted as the baby gets older and bigger. The straps are also designed to keep baby comfy and securely in place during swinging, no matter if the baby is 10 months old or 4 years old. Moreover the height of this swing from the ground can be also adjusted when the baby grows. The seat has also expanders on the bottom and on the side so it adjusted to baby’s size. You can hang this baby swing from a ceiling or doorway. You can also use it as an outdoor swing if you attach it to the swing set, but not every part of it is weather resistant so it’s better not to leave it outside permanently. However, you can easily detach it and store in house when it’s not in use. It’s very lightweight (about 1 lbs) so you won’t have any problem with lifting or carrying it. How to hang this aircraft baby swing? You will need eye bolt lag screws or you can attach D-rings to the rope and then attach it to the portable pull-up bar which can be move from doorway to doorway easily. 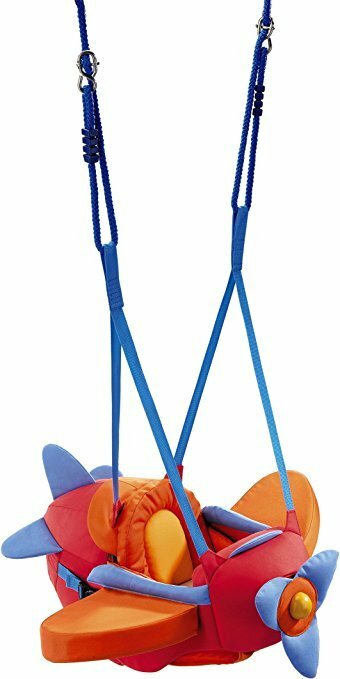 Swinging in this soft airplane is not only a great fun, but also beneficial for child’s physical development, perceptual and spatial abilities and it stimulates baby’s imagination! It will serve your child for years, as it has large maximum capacity. Even a preschooler can ride in it! It’s designed to keep the baby entertained and safe the whole time. This baby swing is highly-rated by parents who have used it. Here are the main features they praise and complain about. Do you consider buying this baby swing? Before you purchase it, read more reviews written by other parents and check available discounts on Amazon. HABA Aircraft Swing is suitable from 10 months and up. It has maximum capacity of 66 lbs. 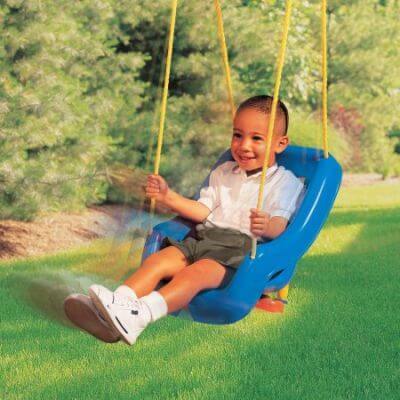 This is the best seller among outdoor baby swings. Why so many parents love it? It’s pretty simple swing seat, but has all the necessary features for excellent and safe playtime. First of all, this is universal baby swing which can be used indoor or outdoor. It’s super easy to install and it’s very lightweight (weighs only 3 lbs) which makes it easy to move, for example from a room to garden, when you want to change your child’s viewpoint. Or you can keep it indoor when it’s raining and hang it outdoor when the weather is fine. It can be hang from a door frame or add to many swing sets. It can be excellent gift for a child who loves to swing. It’s perfect way to encourage baby to be active, while it has also positive influence on child’s cognitive and physical development. And the most important thing: it’s so much fun! And here’s the best part: this swing seat can be used for infants and toddlers! It’s a 2-in-1 product, infant swings and toddler swing in one. You can start using it when your kid is able to sit straight and keep his head up. And it actually grows with the baby and it’s also great solution if there are few kids at different age in the house. It can accommodate a child up to 50 lbs. The ropes are adjustable so you can change their height as the baby grows. The seat is equipped with two shoulder straps to keep baby securely in place. There is also a T-bar that protects younger babies from sliding down and falling out. It is also a place that a child can hold on to during swinging. T-bar rotates so putting baby in and out of the seat is very easy. The shoulder straps and T-bar are easily removable for older toddler who don’t need them anymore. This baby swing gives you the flexibility of using it indoor and outdoor, depending on your child’s preferences and mood and the weather conditions. You can quickly move it from house to garden because it’s very lightweight and installing is a piece of cake. This swing seat is design to keep baby safe while he’s having fun. It promotes spending time in active way and it gives child an opportunity to practice motor and cognitive skills (like visual perception or spatial ability). 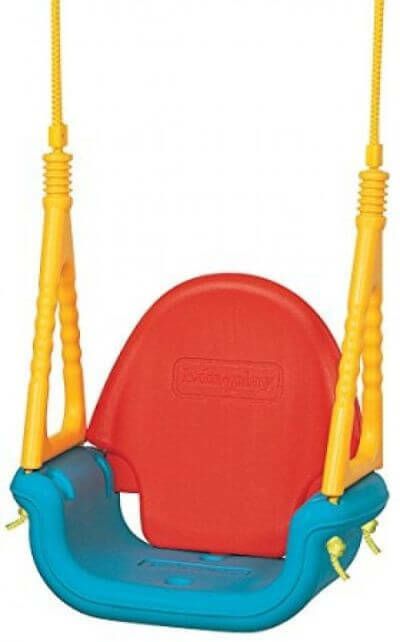 This is absolutely best selling toddler swing. At the time of writing this review, it has over 2 thousands reviews on Amazon (and vast majority of them are 4- and 5-stars!). This is remarkable result. You can check if there are any new reviews HERE. In the table below I present you the most frequently mentioned advantages and disadvantages. This baby swing is a great fun for toddlers and preschoolers. It’s a perfect gift for Christmas or kid’s birthday. What’s important it’s really cheap. Click here to check it on Amazon. Little Tikes 2-in-1 Snug ‘n Secure Swing is suitable for children who can sit straight and have head control. It has a maximum capacity of 50 lbs. Looking for the best outdoor baby swing? You’ve come to the right place! This outdoor swing seat is convertible and grows with the baby. You can use it for 6-month-old infant, toddler and preschooler! So it can actually serve you for couple of years. How great is that!? You can start using it as infant swing, when your baby can sit up straight and has neck and head control, which is usually around 6 months. Than it will serve you as a toddler swing and child swing up to 7 years or 66 pounds, whatever comes first! 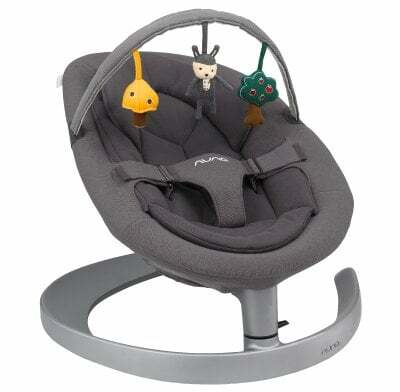 When you use it as infant swing you can recline the seat to provide better support. There is also a T-bar that keeps baby securely in place. When your toddler gets bigger you can easily remove the T-bar. For older child you can also remove the back of the seat. You can hang it outdoor, from a tree or a swing set (it’s compatible with most of swing sets), or you can also use it indoor if you install it properly on door’s frame. I bought this swing for my boys first birthday and we’ve been using it indoors since then, although I must say using it outdoors is more fun for kiddos. What I like about this swing seat is that we can change the swinging height as the baby grows thanks to adjustable ropes. There are also triangular handles that keep the ropes taut and protect them from bending and kinking. It’s important safety features – we all want our children to be safe during this fun activity. This 3-in-1 outdoor baby swing has beneficial influence on baby’s growth and development. It allows children to practice gross and fine motor skills and it promotes perceptual skills and spatial awareness. Your kid will learn and develop while having great fun! This outdoor baby swing is a great investment for years, since it is suitable for an infant, toddler and preschooler. It’s also perfect for parents of multiple children of different ages. 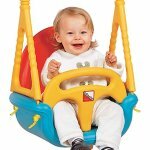 It aids baby’s motor development and keeps child safe and entertained the whole time! This outdoor baby swing will encourage your child to be active and while he will be having great fun he will also develop his cognitive skills. Thanks to this swing seat your child will spend more time outdoors. It will provide him not only excellent entertainment, but it’s also beneficial for his physical and mental development. I checked this baby swing on Amazon and it is really highly-rated there (you can check the current rate on your own HERE). Below you can see the features that parents mention most often. EDU-PLAY Baby Outdoor Swing Seat is suitable from 6 months (when child can sit unassisted) up to 7 years or 66 lbs, whatever comes first. 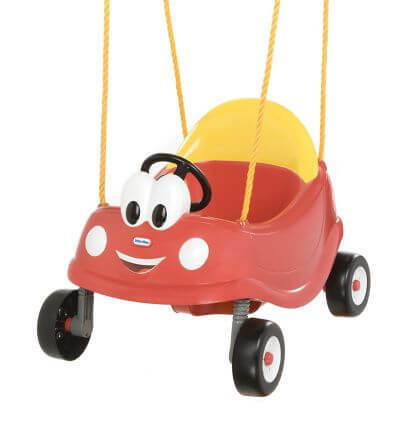 Swinging in this colorful car will be your child favorite activity. Your baby will have a splendid time swinging in like a race driver. It will stimulate his imagination, encourage to practice gross motor skills and develop spatial ability. And it’s so funny to spend time in it. You can be sure your baby will love his first car! It can be used as indoor and outdoor. It fits in most swing sets and has weather resistant rope and seat so it will be perfect for your backyard or garden and you can keep it outside all year round. This baby swing will stimulate your child’s imagination while he’s feeling like a real race driver! The whole swing is easy to maintain clean, you can easily wipe it with a wet cloth or sponge. You can also install it at home, just hand it from a ceiling, doorways or attach it to a pull-up bar. The seat is suitable for tots who can sit unassisted and have neck and head control. Putting baby in and out is very easy thanks to a wide seat and leg openings and it can be done from the front or from the back. The seat is pretty deep and there is a steering wheel that child can hold on to, both features keep baby in place and prevent him from falling out. There is also an adjustable seat belt to provide safe riding. 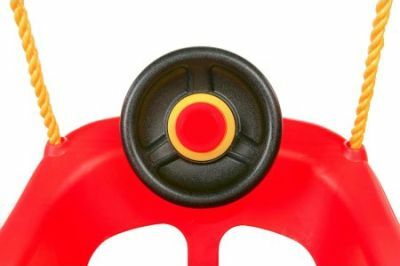 The steering wheel has also a horn that keeps baby amused and allows him to feel like a real driver. With a steering wheel and a horn swinging is even more funny! This baby swing from Little Tikes is one of the best outdoor swings for 2019. It encourages baby to active and imaginative play. It provides safe and comfy place for playtime, during which your child will also develop his cognitive and motor skills. It’s made of weather resistant materials so it can be used outside in a backyard or inside the house. It light and easy to hang so you won’t have any problems with moving it from indoor to outdoor. You will love the flexibility it gives you and how it entertains your little one! This baby swing is not only very popular on Amazon but also has really high rate! It has almost only positive reviews. Here are the features that parents praise most often and few drawback they mention. Do you like this toddler swing? Before you decide to purchase it, check available discounts and other parents reviews to make sure it meets your needs. Click here to check it on Amazon. 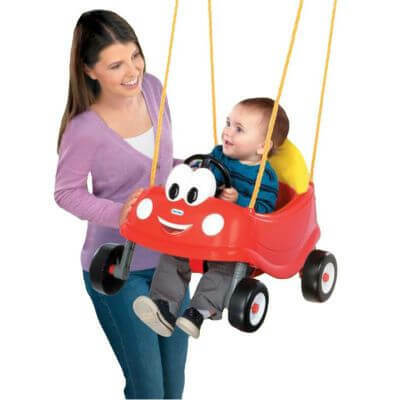 Little Tikes Cozy Coupe First Swing is suitable for babies from 9 months to 3 years. It has a weight limit of 50 lbs. I decided to add a little bonus for you – my top 3 baby bouncers. They offer a bit different features than baby swings. I’m aware that not all parents are fans of baby swings, but we all need a safe space for our little ones, right? Something that would keep the baby entertained for a while when mommy has to do laundry or prepare a meal. Something that would sooth babies and help them to fall asleep. And here baby bouncers come to help. Nuna is well known for its luxurious and fashionable products and Nuna Leaf Grow Bouncer is one example of that. It truly grows with the baby – from newborn stage up to 130 lbs (!) and adjusts to child’s changing needs. This bouncer comes with organic infant insert that cuddles the small infant. It provides not only a cozy space for the baby, but also gives nice support for infant back, neck and head. What’s really great about this bouncer is that it converts into a toddler seat! As the baby grows you can remove the insert and the sitting are will be wide enough to accommodate even a preschooler! 3-point harness also adjust as the child gets bigger. 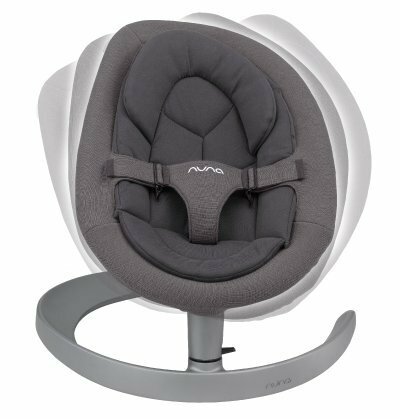 Nuna Leaf Grow Bouncer weighs only 15.4 lbs and the seat detaches from the base, so moving it from one room to another or storing is very easy. Moreover, it has beautiful, chic design so you can be sure it will look great in your bed room, as well as living room. 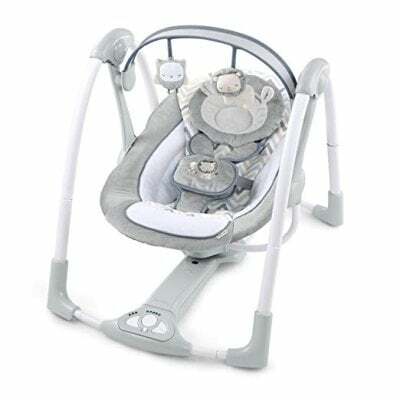 This bouncer offers 3 reclining positions which you can adjust for play time and nap time. 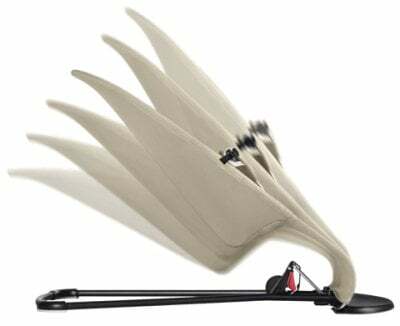 There is also gentle side-to-side sway motion which lasts over 2 minutes with just a light push. And since it works without a motor, it’s completely silent – in contrast to baby swings. If your baby in a light sleeper, you’re going to love it. With Nuna Leaf Grow Bouncer you don’t have to worry about any noises or buzzing disturbing your little one’s snooze. You can also lock this bouncer in stationary position for example when you want to feed your baby. What you’ll also love about Nuna convertible bouncer is the toy bar. It comes with three colorful toys that attract baby’s attention and encourage baby to grasp. One of the toys even rattles to stimulate not only baby’s vision, but also hearing. You can adjust the toy bar position depending on the child’s age and size or simply remove it from the bouncer. Psst! If you purchase Nuna Leaf Grow on PishPosh Baby the toy bar is included in the price! Of course the best part is that Nuna Leaf Grow really evolves with the baby. So you can start using it as a bouncer and when the baby can sit unassisted and walk you can turn it into a toddler chair. All kids love having their own space and thanks to Nuna this space is comfy, safe and cute. Let’s face it, Nuna Leaf Grow is expensive (you can check the current price and discounts here), no wonder that it has only few customer reviews online. But parents agree on one thing: this bouncer is a long-term investment and the quality is top notch. Nuna Leaf Grow Bouncer can be used from birth up to 130 lbs. At the beginning use it with the infant insert (included!) and harness – until the baby can sit unassisted and hold the head up. For walking child use Nuna Leaf Grow as a chair. This stylish bouncer has been parents’ favorite for a few year already. It looks elegant, the design and functions are simple and it’s comfy for babies up to about 2 years. 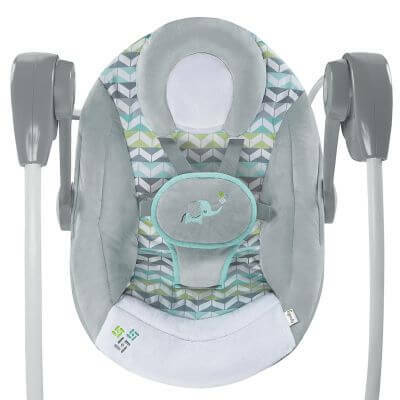 BabyBjorn Bouncer Balance Soft is padded with comfortable fabric that is suitable for baby’s delicate skin and at the same time, it provides proper amount of support for baby’s back and head. There are three height positions – you can change it as the baby is playing, resting or napping. More upright position is very useful for babies with reflux. Besides, as the baby moves, the bouncer gentle rocks which is both soothing and entertaining for the baby. And it allows the child to train balance. With BabyBjorn Bouncer Balance Soft you can do household tasks, while your baby is occupied for a while in a comfy and secured seat. There is a 3-point harness that keeps baby secured in places. To keep the baby more engaged and entertained you can add a toy bar to Baby Bjorn bouncer (sold separately). It’s also very useful during feeding the baby. Similar to Nuna bouncer, BabyBjorn Bouncer Balance Soft doesn’t require any batteries or adapter = zero noise and buzzing. Besides, the bouncing and rocking movements are natural (the bouncer follows baby moves) which is very engaging for the infant, as well as helps him to develop motor skills. You’ll also love the fact that the seat fabric is removable and you can clean it in a washing machine. Even if your baby often spills, you don’t have to worry about stains. What’s also great is that you can choose the fabric for your BabyBjorn bouncer. You have 3 options: cotton, cotton + jersey or mesh. The latter one is perfect for summer weather or hot climate as it’s very breathable and keeps baby from sweating. The fabric is fitted which means not only a proper amount of support, but also even weight distribution, to prevent baby from pressures on some parts of baby’s body. You’ll love this BabyBjorn bouncer because it’s versatile and convertible – you can turn it to toddler seat and it can accommodate a child up to about 2 years. Another advantage of BabyBjorn Bouncer Balance Soft is the possibility to fold it. When you’re looking for a baby swing or bouncer, you mainly focus on its features related to baby’s comfort and safety. Sometimes parents forget how important is the product weight and fold size! Good thing is that BabyBjorn bouncer is lightweight (only about 4.6 lbs) so it’s very portable. And it folds flat for more convenient carrying and storing. It will take up a little space in your closet or under your bed! This baby bouncer is extremely popular, although it’s not the cheapest product (check the price on Amazon or on PishPosh Baby). It has hundreds of customer reviews all over the Internet. Here are the main things that parents love the most and drawbacks they complain about most often. BabyBjorn Bouncer Balance Soft can be used from birth (minimum weight 7.8 lbs) up to 29 lbs. Use it as a bouncer up to 20 lbs (until the baby sits unassisted) with harness. Turn the fabric around to convert it to a chair for older and heavier child (up to 29 lbs). At the end I’d like to tell you a bit more about Tiny Love Nature’s Way Bounce and Sway which offers few more functions than the other two bouncers in my ranking and has more pocket-friendly price. It sways from side to side and bounces – following baby’s natural movements or parents’ push. All thanks to springy seat frame. But that’s not all. In contrast to Nuna and BabyBjorn bouncers, this one plays music. There are 19 tunes in 3 categories (8 playful tunes, 8 soothing tunes and white noises). Together 25 minutes of continuous music. There is only one position which is a bit reclined. It works great for playing with the baby or feeding them (when they start solids). It’s also comfortable for a nap during the day. This bouncer is versatile and offers 2 different motions for baby’s different preferences and mood. Thanks to Tiny Love Nature’s Way Bounce and Sway you can have one piece of baby gear which can serve you in two ways: as a as a bouncer and swing. This means less money spent and more free space at home. Moreover, you can set it in stationary position and prevent it from swaying. There is also vibration mode that may be helpful for calming some babies. This bouncer comes with a toy bar with two rattling toys that stimulate baby’s senses and encourage baby to practice motor skills by reaching for them and grasping. It also helps the baby to develop hand-eye coordination. It also engages baby’s hearing since it plays variable melodies. Thanks to that it attracts baby’s attention and keeps baby occupied even longer. This bouncer is great choice for babies who get bored quickly and need something to engage them when they are lying. Keep in mind that you will need batteries for vibration mode and music. However the bouncing and swaying motions are “powered” by baby’s movements or manually by parents. There is also cozy infant body pillow forms around baby’s body to provide proper support. In contrast to other bouncers in this ranking, this one has 5-point harness to keep the baby secured. Seat fabric is removable and machine washable which is a big plus. Affordable price is the cherry on top. To see how much this bouncer costs right now I recommend you to visit PishPosh Baby. This baby bouncer doesn’t have many customer reviews, but generally speaking parents like its functions. Besides, it’s more affordable alternative to pricey high-end bouncers. Tiny Love Nature’s Way Bounce and Sway can be used from birth and can hold a child up to 25 lbs. Babies love rocking, cradling and swinging. It soothes them and may be very enjoyable for them. Moreover, according to neurologists, rocking can also stimulate vestibular system in little baby’s brain which may have beneficial influence on baby’s development. Rocking is not only pleasant for the baby, but also for parents. However, children get used to it very quickly and your arm can start hurting after few minutes of cradling. That’s why baby swings and rockers are so popular nowadays! It’s really magical how quickly they can calm the baby. Of course an infant should not spend too much time in it, but this piece of baby gear can be very useful when a child is fussy or colic. 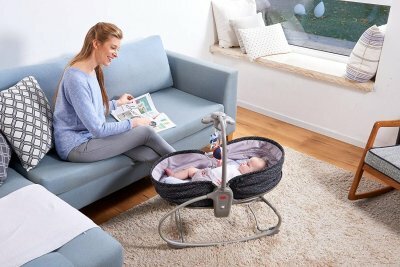 This is also a great solution for parents who want to perform household duties – swing or rocker is a secure place where baby can lie a little bit while parents take care of the house. Every parents deserves to have time for yourself, time to rest and relax. And every baby deserves the best products, that are comfortable and safe for their health. That’s why I created this ranking to show you how to choose the best baby swing 2019. Swings can be very helpful for parents, when chosen and used properly. Does it have compact fold? Is it made of high-quality materials and fabrics? Is the seat comfortable for the baby? Does it have a harness? Is the base stable, not wobbling? What are the age recommendations and weight limits? Is this swing also suitable for sleeping? Will it grow with the baby and does it sense baby’s weight? Many parents decide to buy a swing or rocker for their baby for many different reasons. These products are very helpful, especially for first time parents. However, it also causes a lot of discussions. Some people think that swings are only for lazy parents. For others it is a life saver. What are the main pros and cons of baby swings? Thanks to swings parent can do housework without worrying about baby’s safety. Swing provides secure place for newborn and infant and it can be used in every room in the house. For example you can put the swing into the kitchen and keep an eye on your baby while preparing a dinner or cleaning. Therefore swing is perfect solution for a mom who has to do all the housework while taking care of the baby. Swing has many safety features – there is a harness that keeps baby in place and prevents baby from falling out or hurting yourself. Swinging and rocking is very pleasant and soothing for the baby. It calms the baby and sometimes helps to put the baby to sleep. This piece of baby gear is usually very portable and you can take it with you even for a travel. Most of swings can be folded and easily fit even in a small cars. The baby lying in the swing has quite limited mobility (can’t sit up or crawl). If baby is lying in swing for too long, it may have negative impact on his spine and hips. Therefore baby should not spend too much time in a swing or rocker. You can use it when you need to do housework or use it to put baby to sleep. However baby should not sleep in it for a long time. After your child falls asleep you should move him/her to the crib or bed. 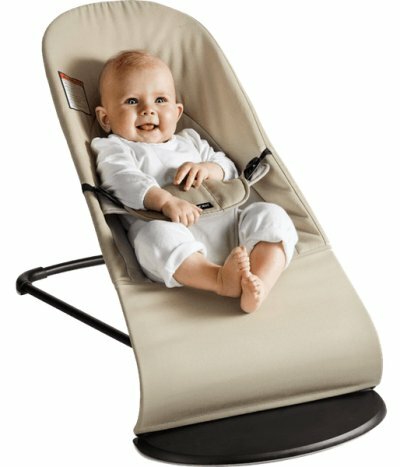 If you are looking for a baby swing you should keep few things in mind. Functionality – Baby swing should be multifunctional, versatile and useful. Adjustable seat height is very nice to have feature, as well as removable seat padding that can be washed. 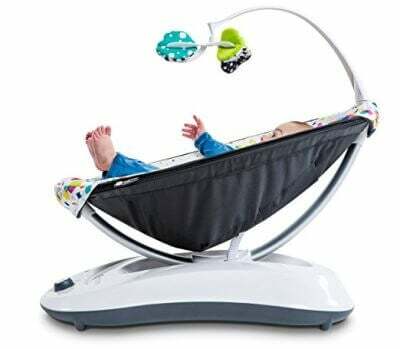 The swing should offer few modes (for example swinging from side to side and back and forth) and speeds so you could find the most comfortable option for your baby. It should be easy to fold and portable. After folding it should take up small space. Safety – there has to be a harness to prevent baby from sliding down or falling out. Materials should be high-quality, suitable for newborn delicate skin and have proper attests. Other features: some swings also vibrate or play music – it should not be scary, but subtle, pleasant and soothing for the baby. There are also some all-in-one products, that combines features of swings, rockers and bouncers. Although not every parent is a fan of baby swings, this baby products may be a real life saver for many parents – especially first time parent and those who take care of multiple babies of different age. Babies love rocking, bouncing and swinging and for some of them it is the only way to comfort them when they are colic or teething or it is the only way to put them to sleep. But after a while your arms start killing you and you feel like you could really use a break. And here’s the baby swing comes with help. Some of baby swing offer rocking from side to side or cradling from head to toe, others imitate parents’ moves when they are comforting their babies. They provide cozy and safe space for playtime and naptime. And thanks to them parents can finally have a break and have time only for yourself or for taking care of other duties like housework or job duties. Baby swing may be very handy for your newborn or infant. Remember that when the baby is able to sit unassisted and crawl out of the baby swing, it is not suitable for him anymore. Don’t worry, you can switch to toddler swing seat then! I hope my baby swing reviews helped you to choose the best product for your little one. If you’re still hesitating which baby swing to choose, let me know in the comment section below and I will do my best to help you find something that suits your needs! What Is The Best Stroller For Growing Family?